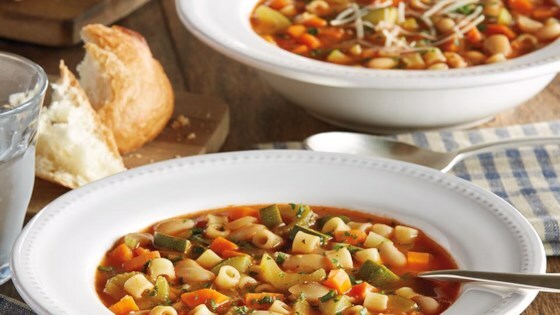 "Minestrone is a hearty, traditional Italian soup typically made with beans, pasta and lots of vegetables. Enjoy the slow-cooked flavor in just about 30 minutes." A quick soup that is full of flavor and comfort! Other small pasta can be used instead of ditalini. Quick, easy, and tasty. I used spinach instead of zucchini, because that's what I had. I made this for my Italian mother in law and she just loved it. said it was perfect. I was so glad it was a hit.